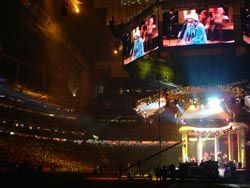 LD Systems provided sound, lighting, and video support for the Houston Rodeo.LD Systems formed like many staging companies did in the 1970's, through the founders' desire to work with bands and give them the sound reinforcement the industry needed. But, unlike most companies, LD Systems has become one of the largest in the industry, branching out into new areas of expertise while retaining a firm grip on what made its name. LD Systems began in 1973 when Rice University students Andy DiRaddo and John Larson began renting sound equipment for local Houston gigs out of DiRaddo's parents' garage. In 1975, John decided to join the armed services and Rob McKinley replaced him as DiRaddo's business partner. They continued to complete their degrees at Rice while working full time to build LD Systems. McKinley is now the current owner after buying the company almost five years ago. LD's director of production services and operations manager, Robert Ausmus, spoke on his history with the company. "Everyone's friends were in bands, and everyone needed sound support back then. That's how I became came an employee. Rob and Andy were always trying out their equipment on my band, and I was always the techie in the group, so I'd always push LD's systems. I've been here now 26 years." LD now has two branch offices around Texas. While the Houston office is the company's flagship, the San Antonio office has allowed the company to expand. Within the company itself, there are several divisions, including a systems integration entity that has done the largest stadiums in the area, including Reliant Park and the Toyota Center. The company is moving soon from a 45,000 square foot building to an 85,000 square foot building in November. With 82 employees full time, many of them the original staff, and probably 200 freelancers, the company is thriving. One of the company's most successful divisions has been LD's concert sound division. While most staging companies occasionally work on tours, LD has made this market a foundation of its success. Ausmus explained, "We've always been into the touring thing since the beginning. There were a lot of musicians but not so many sound companies back then. We were often providing systems for all the bands coming through Houston in clubs. We'd pick bands up out of there for tours. And then word of mouth spread. When you've been around so long, stuff just pops up." LD Systems provided support for the Shell Downstream One Conference. For a staging company, the touring market can often be an unattainable industry, as Ausmus has noticed. "The touring market is somewhat of a closed loop these days, with the rollups of Claire Brothers buying ShowCo, DB Sound, and Sound Image. Some of these other corporations are soaking up productive companies, and it's getting tougher and tougher to compete. The touring market is quite cliquey. It's a system that feeds on itself. I've seen guys make careers just farming out of the market. We're starting to create our own internal referrals." Another profitable market for LD has been the Rodeo industry. Ausmus expanded, "We do eight or nine annual rodeo events, inlcuding San Antonio, Houston, Waco, Austin, Dallas, and the finals in Las Vegas." LD has achieved success because of the diversity of its business, but this can also be a tricky aspect to grasp when assigning crews to shows. Ausmus said, "The interesting thing about us is mix of what we do. It's our strength, but sometimes it can be our weakness. One day we'll be doing a high profile corporate job, and the next we'll be doing a street fair. The strength is having that market to work out of and be known within, but the weakness is having a guy that's doing a corporate show being pushed into a festival the next day. It can be a rollercoaster for our staff." The complexity of LD's schedule often makes finding the right employees harder. Ausmus explained, "We tend to hire guys that can tread through whatever comes their way. Other times we'll just cherry pick out of the freelance pool. A guy that's all inked up we can send to a radio show, but now a corporate show. We mull through hundreds of resumes to find the right staff for the right market. We spend a lot of time doing that." Most of the time, working with so many different markets can help more than hurt, as Ausmus noted. "After 9/11, there was a big dip in the corporate sector, but we didn't miss a lick, because we work with a lot of churches and they did a bunch of feel good events. Where we lost two or three small jobs, we picked up a huge job. There's always something shaking in one of the sectors of the entertainment industry." For more information visit www.ldsystems.com.